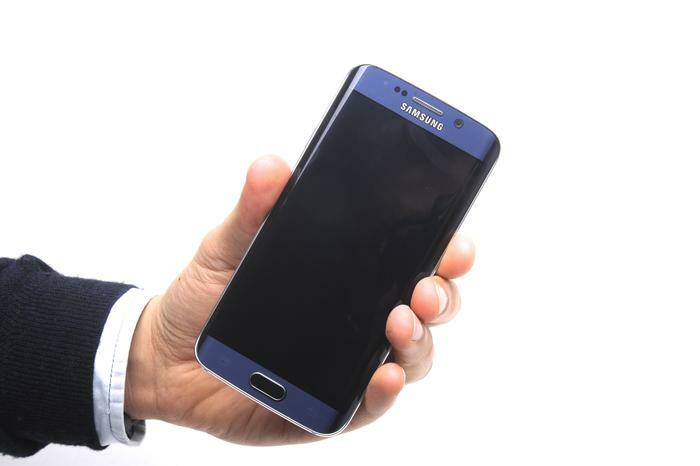 A new breed of Galaxy flagship has gone on sale with the S6 Edge. It is the first smartphone in the world to have its screen curve on both sides, introducing some features of note as a result and redefining what was previously possible in smartphone design. Editor’s note: The Galaxy S6 Edge shares most of its hardware and its software features with the Galaxy S6. Although the vast majority of this review is original, parts have been lifted from the S6 review as our findings on the shared features have not changed. All of the hallmarks that make the Galaxy S6 an attractive smartphone can be found on its Edge sibling. Tempered Gorilla Glass 4 covers its faces and the application of multiple nano-coatings results in its colour shifting tones along with the whims of light. Metal has been used for the chassis and this leaves the smartphone feeling solid, while attention has been paid to fine details, such as its buttons and ports. The S6 Edge has the same screen as its sibling. It spans 5.1-inches, has a high 2560x1440 resolution and a market-leading 577 pixels-per-inch. A case can be made for the high pixel density when it comes to displaying the detailed photos captured by its camera, or for using the smartphone in its virtual reality headset. 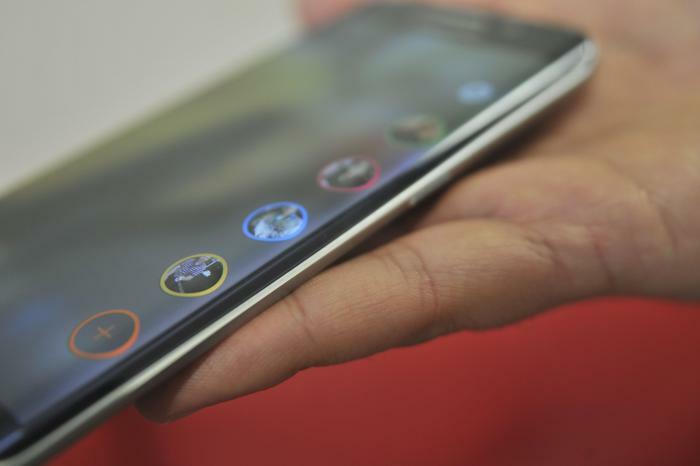 What separates the S6 Edge is the curve of its screen. No other smartphone in the world has two curving edges and doing so requires the screen's glass be heated to 800 degrees Celsius. We find the curving screen better suited to the S6 Edge than the iteration used on the Note Edge phablet. Applying the effect to both sides upholds the smartphone’s symmetry and this makes it both more comfortable to hold and more attractive. The screen subtly folds half-way down the sides until it is stopped by the bevelled edges of an aluminium chassis. Swipe inwards from the edge display and five of your favourite contacts appear. They can be associated with specific colours, and when the smartphone is face down, the edge display doubles as a stylised notification light. Information can stream down the screen in the same fashion as the Note Edge. Yahoo powers news tickers for sports, stock prices and news; a Twitter pane serves up continuous tweets; and a notification pane publishes updates from applications of choice. 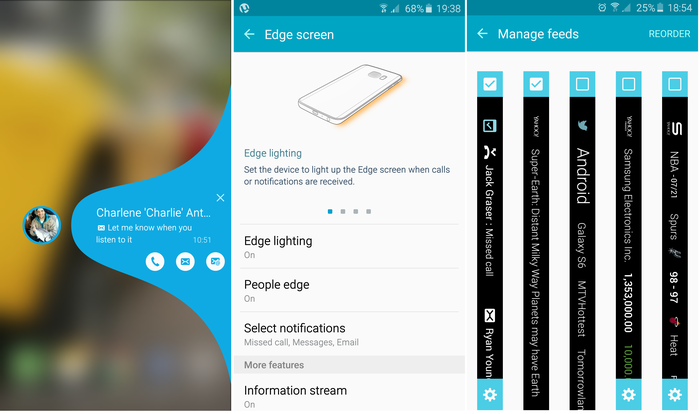 In this regard, the Edge display’s functionality overlaps that of the notification blind built into Android. Downloading more panes is possible, though the range remains limited in number as it is early days for the ecosystem. And by early days, we mean only three additional panes could be downloaded at the time of writing. Viewing these notifications can be done without turning on the screen. Quickly run fingers up and down the edge display and only the pixels needed for the ticker will turn on. Such a feature makes it possible to stay in the know discreetly during an office meeting or a child’s recital. The only sign of lag experienced using the S6 Edge happens when waiting for the edge display to illuminate. All of the curved display’s features can be turned off. Being able to turn it off makes the S6 Edge an appealing smartphone for business and personal use. Not everyone will want to be bombarded by information of all sorts. Some might want it purely for the cut of its screen. Select convenient software features found in the Note Edge are not found in the Galaxy S6 Edge. Music controls are not relocated to the curved display, nor is the shutter key for photos. Not offering all of these features keeps the software of the two S6 variants in line with one another; an important factor if software updates are to be released uniformly across the range.